Our Parent Liaison Tamra Cherubin addresses a group of parents and family members. 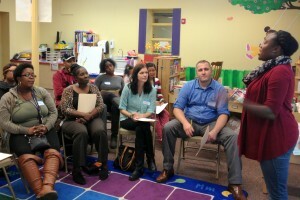 On Wednesday September 30th, RCN held the first Parent Workshop of the new year! RCN Parent Workshop series was created to support the Positive Behavior strategies we use in our classrooms. The first Workshop was called “Building Positive Relationships with Children.” If you missed this one, you’re still welcome to join us for any of classes below. Coming up on October 28th, the topic will be “The Importance of Playing Together.” Sign up using the form below. Not an RCN Parent? That’s okay too. Classes are open to the public, even if your child is not enrolled at RCN. All parents, family caregivers, childcare providers, and other members of the community are welcome. At these workshops, you’ll learn from expert presentations and dialogue with other parents about how positive behavior reinforcement strategies can be used in your home. Wednesday, 02/24/2016: Tools part 2: Skill building for all! 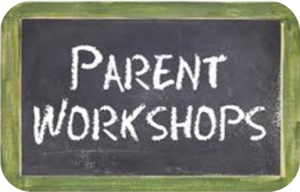 Sign up for the next Parent Workshop below!